THIS WEDNESDAY IN the Dáil, TDs will listen to and vote on a motion which would would legislate for a directly-elected mayor of Dublin, with a range of powers in areas such as housing, transport and land-use. The issue has been a hot topic in recent years, but the current Lord Mayor, and at least four other people who have held the role of mayor in the past 7 years, are supportive of a directly-elected mayor with the responsibility for these important issues. His predecessor, Sinn Féin’s Críona Ní Dhálaigh, is also supportive. It is badly needed needed for Dublin. I would love to see a directly elected mayor but it would be pointless if it didn’t have any real power to make a difference. Stronger local government needs to be a priority. 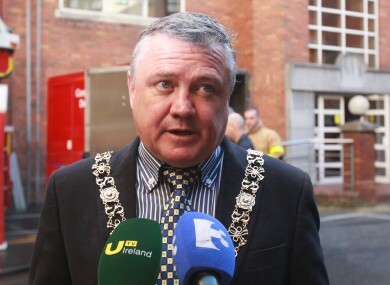 Former Lord Mayor for 2012-13, Fine Gael’s Naoise Ó Muirí, said that he would support the appointment of a directly-elected mayor, adding that “it would be beneficial to people across the whole Greater Dublin Area”. The Labour Party’s Oisin Quinn, who replaced Ó Muirí as Lord Mayor in 2013, agrees. Dublin has the core ingredients of a super city. For Dublin to get into the Champions League of European cities and maximise the potential of the city, we need a directly-elected mayor. Under a directly-elected figurehead, it would become a great deal clearer as to who the responsibility for Dublin-related issues lies with, according to Quinn. Emer Costello, who held the role in 2009/10, concurred. Although no longer politically active, she told TheJournal.ie that it is “unfortunate” that people have not had a chance to have their say on this specific issue. “I would certainly support a plebiscite,” she said. Put forward by the Green Party, the “Local Government (Mayor and Regional Authority of Dublin) Bill 2016″ would see a Dublin mayor given powers that mirror that of the Mayor of London. Green Party leader Eamon Ryan believes that the bill provides a “very real chance” of Dubliners voting for a Mayor by 2019. Ryan said: “Now, more than ever, we need strong leadership to tackle the housing and transport crises facing our city. It is time we got the development of urban Ireland right and directly elect a mayor with a vision to take on that task. In 2014, proposals to hold a Dublin-wide vote on a directly elected mayor were dropped, after Fingal County Council blocked the proposals. Although the other Councils voted in favour of a public vote, Fingal’s veto essentially shelved those plans. Many councillors at the time argued that the proposal for a plebiscite on the issue was being rushed, and there had not been enough public debate on the issue. Now in 2016, the Green Party has brought this issue to the fore again. While former Lord Mayor of Dublin, Labour’s Andrew Montague has noted that while the position, in its current guise, can be used to help support investment in Dublin, the role doesn’t possess a great deal of scope. Writing on TheJournal.ie just before leaving office in 2012, he said: “Our current system is so cumbersome that people disengage from local politics, it’s very hard for them to influence what’s going on. Councillors have very little executive power. They have influence but no executive power and city managers aren’t elected so it’s very difficult for public to have an influence. It’s poor democracy. At the moment the vast majority of people don’t have a clue who I am, they don’t know who they’re city manager is either. The Bill proposed by the Greens would see the establishment of a new Regional Authority of Dublin, from which the mayor would sit above the existing four Dublin Local Authorities – Dublin City Council, Fingal County Council, South Dublin County Council and Dún Laoghaire-Rathdown County Council. The mayor would assume responsibility for the coordination and leadership within policy areas such as land-use planning, housing, transport and waste management. Although supportive of a directly-elected mayor, Naoise Ó Muirí believes that the devolution of power to such a figure would be problematic. “The role would not just devolve powers on a political level,” he says. “But from the civil administration level, also. “Dublin is probably the only place you can do it,” he added. With the Bill set to be debated this week, and with Eamon Ryan claiming support from all parties on the issue, a directly-elected mayor could be as close as it’s ever been. What do you think? Should Dublin have a directly-elected mayor? Email ““For Dublin to get into the Champions League of European cities, we need a directly-elected mayor””. Feedback on ““For Dublin to get into the Champions League of European cities, we need a directly-elected mayor””.